Click on the map below to get directions from Google Maps. Coming From the 5 South, or 8 West: Take Rosecrans Street west, left on Shelter Island Drive, and left on Shafter. We are located on the left on the corner of Shafter and Carleton. There are customer parking spots in the rear of the shop. Take ramp right for I-8 West toward Beaches, bear left onto Sunset Cliffs Blvd, turn left onto Nimitz Blvd, go right on Rosecrans Street (west), left on Shelter Island Drive, and left on Shafter. We are located on the left on the corner of Shafter and Carleton. There are customer parking spots in the rear of the shop. 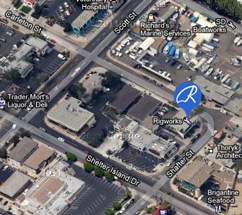 Coming From Downtown San Diego, or Harbor Island: Take Harbor Drive west past the Lindbergh Airport, turn left on Scott Street, left on Shelter Island Drive, and left on Shafter. We are located on the left on the corner of Shafter and Carleton. There are customer parking spots in the rear of the shop.